How much would you charge us to come to Laramie and tell a guy that he smells bad? I don’t know what it is, because he has had the same bad smell for as long as I’ve known him. In one of the offices they use room spray after he leaves. I told his boss the B.O. story you told in class, but he says it doesn’t effect the guy’s work, so he can’t say anything to him. 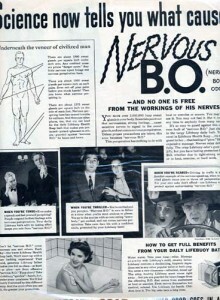 Do you have a B.O. consultant rate? 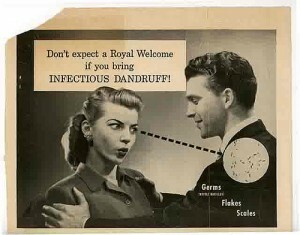 I love the old ads! What would Nullo be? The biggest problem is when it’s your boss who has bad breath. We had that problem once and we all dreaded having him lean over our desks to talk. Nice guy, but his breath would knock you over!!!!! I think that’s harder to talk to someone about than B.O. As an HR specialist, the complaints I get from employees who have been talked to about personal issues are about managers who say something unncessarily crude or rude or who hint or say something in a public setting. It’s also wrong to leave an anonymous message on someone’s work locker or desk. I tell managers to treat this like any other work issue and not make it more difficult than it needs to be. Your advice is right on and would save a lot of concern and complaints. Tina says: Thanks to all of you for your comments. Wiseacre: Odor and appearance are part of work effectiveness and the manager simply doesn’t WANT to say something. The people using the room spray should ask that definite action be taken. And people like you could say something too. You could do it! Denise: I know what you mean about the bad breath issue. I once had that situation with my supervisor and started my program to improve it by giving him a mint and telling him he must have eaten something with bad after-effects. (That was the phrase I used.). Then I offered him a mint every time I noticed it. He never improved much, but he stopped getting so close to me, so that was a help! 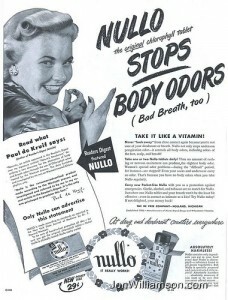 And, Nullo is still sold and many people think it is effective for them. It is primarily chlorophyll and isn’t harmful when taken as directed. 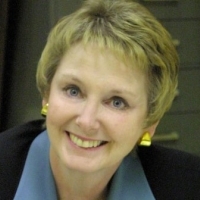 Careerist: Thanks for your thoughts! I appreciate your insights. Do you have any advice for dealing with someone who spits tobacco into a cup or pop can all day? It’s repulsive and gross to everyone else, but we’ve been told by HR that there is nothing we can do about it. 1. Have the coworkers or supervisor link it to work and say that the sptting must stop or be done away from the common work area. The best link to work is that it is distracting for all the reasons you mentioned as well as others. That is more easily established when one or more coworkers or supervisors are willing to speak up about it. If no one is distracted or notices and there is no rule against it, then there is no problem. But, if there is a reasonable complaint made about it, there is a reason to do something. 2. The best way to deal with it is to establish a tobacco free work-place (not just a smoke-free workplace.) Many places do not allow use of tobacco products at all, for good reason. What we usually call chewing tobacco is really spitting tobacco. It is unsightly in someone’s mouth if they talk; it is smelly on the breath; it is gross to see saliva being spit; and, it is obnoxious to see it in paper cups on desks or in the trash. A pop can is a better alternative, but is also unpleasant to see. It would be equally unpleasant if someone just decided to spit out their saliva all the time for no reason at all–so the spitting is the first bad part. The idea of communicating with someone who has black juice on his or her lips or teeth is another aspect of it. I’ve been asked about the more tidy little tobacco pods used by some. The issue at work is this: Is it distracting, is it harmful to others and/or does it reduce work productivity or effectiveness when interacting with others? If anything being done or used by an employee does those things a supervisor or manager should intervene to stop it or at least to find out more and work with the employee to develop a solution.